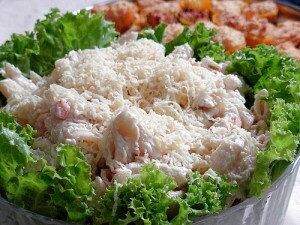 Chicken Macaroni Salad recipe by Nazia Nazar at DesiRecipes.com. Boil 3-4 cups of water with 1 tsp of salt and 1 tsp of oil. Add macaroni to the boiling water. Cook covered for 8-10 minutes till soft and well cooked but not mushy. Strain and wash several times with cold water. Pressure cook to give 2 whistles. Drop the pressure by putting water on the lid of the cooker. Cool and shred the cooked chicken . Add the chili paste and tomato puree. Add the tomato sauce and 3/4 cup of water. Simmer the sauce on low flame for 12 minutes. Add salt , sugar, chili powder. Keeping the flame low add the cream. Add the cooked macaroni, chicken and parsley. Transfer to a bowl and cover and keep in a refrigerator to chill. Before serving arrange some lettuce leaves on a serving platter. If salad gets a little dry add a few tablespoons water to get a slightly wet consistency. Transfer the macaroni salad on the lettuce leaves. Deseed the capsicum and cut into thin rings. Half the rings and arrange on the edges.